Notice the orientation... ok perhaps not thát much of a big deal that it doesn't point 3ds north, the dimensions are a bigger issue anyway. With the unitsetup I have atm every section is like 7,68 by 7,68 meters. What's odd is that it basically mirrors the segment though. At importing I do see a YZ-flip option, but that basically rotates it into a ''standing'' section of land instead of laying down. And maybe a bridge to that generic runway area to the north of the main island? I Know is a lot of work but is possible? or traffic does not support other road? No matter what you do to the mesh it never seems to change in game. And also with the latest version i have that rotate problem. It's either something with the sector being replaced, or something with the export/import. Texturing is still missing (handmade section physics too but it shouldn't take too long), but after that done only the hardest part will be left (havok + object export :p). 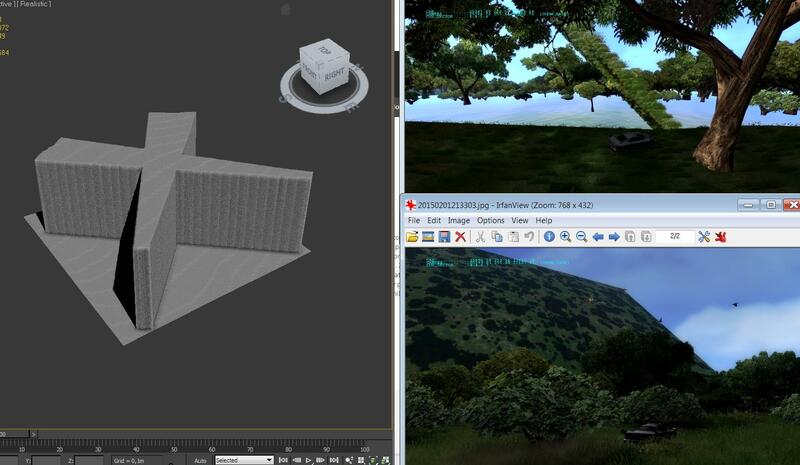 3DS max .obj exporter adds 2 space between the values and the start of the line whereas Blender only adds one space. As a result, 3DS max files were always using the X axis values instead of the height... :D (which explains that weird 45° error). I'll correct that for the next update. The only cons so far are the size limitation (I've been trying calculating everything but it's still missing something somewhere which make everything crash :p), the fact you can't swap collision files between sectors (there are probably some scale issues or axis values) and obviously you can't add more mesh to a file. As long as your road mesh isn't too complicated, it should be fine. I'll probably upload some guide to explain the havok edition since it could be a little bit tricky. Basically you need to name your new mesh the same name as the mesh you'd like to replace (both object and mesh if needed). You also need to respect the face and vertex count of the already existing mesh (you should get a warning message if anything's wrong about that). Speeder, I heart you. Without being homo doe. Insane work! !